On June 30, 1838, the US patent No. 821—the first for a furniture caster—was granted to the Blake Brothers of New Haven. The brothers, Eli Whitney Blake, Philos Blake, and John Blake, all nephews of Eli Whitney, established the hardware casting and furnace works in 1835. Located in the Westville section of New Haven, the company manufactured door locks, latches, hinges, and other articles of domestic hardware—many of which were eventually patented. The most celebrated of the brothers’ inventions were their mortised locks, Philos’ corkscrew, and Eli’s stone crusher for macadamized roads. Eli and Philos Blake had gained invaluable civil and mechanical engineering skills working at the Whitney Armory, their uncle’s arms factory, which they continued to run for 10 years after Whitney’s death. 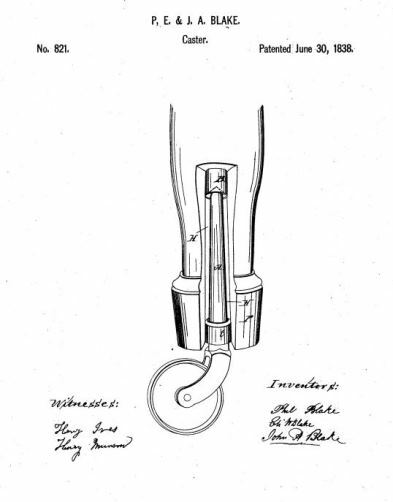 The caster patent was the first in the US for a furniture caster and was submitted as an “improvement in the mode of constructing casters and applying them to bedsteads.” The improvements to the caster included how the caster was inserted or supported in the leg of a piece of furniture so that it could be easily adjusted or removed. Blake, Eli W. Patent Number 20,542 - Machine For Crushing Stone. 20,542. New Haven, CT, issued June 15, 1858. Link. Blake, Philos. Patent Number 27,665 - Corkscrew. US27665 A. New Haven, CT, issued March 27, 1860. Link. Blake, Philos, Eli W. Blake, and John A. Blake. Patent Number 821 - Mode of Constructing Casters and Applying them to Bedsteads. US821 A. New Haven, CT, issued June 30, 1838. Link.